Apologies for my absence last week (let's just say a 40+ hour work week and a migraine do not go well together.) But thankfully, after a few days of soreness and sleep, I'm almost back to normal. And thank goodness for that, because it's finally October. While my favorite month is probably December (Christmas, my birthday, holiday music etc. ), October is close behind in the number two spot. Colorful leaves, chilly weather, pumpkins, apples, blankets and wool socks - I can't think of anything I dont like about October. 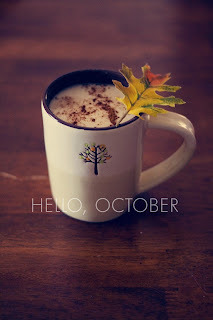 And now that one of my favorite months is here, I can't wait to celebrate all that fall has to offer. 10. (Is it too early for me to say this?) Start shopping for Christmas!